Successfully Added Facial Recognition Time Attendance System to your Shopping Cart. Face recognition technology. Embrace the world of advanced time attendance systems. Beautifully designed to compliment any imaginable décor, this facial identification time attendance system recognizes faces in 3D by utilizing the internal dual sensor and dual camera that allows it to establish an incredible facial recognition algorithm in a fraction of a second. Coming with dual cameras, night vision, 3.5 inch TFT display screen, touch keypad, USB and Ethernet port for TCP/IP connections, that all contribute to the simple installation and usage of this face identification device. Encase your network experiences any problems, you can download attendance records using a USB flash drive. Included with the Hanvon face recognition attendance device, is a management software, which allows you to define work time, vacation time, overtime, etc., and give you full data and reports by department or individual so you can see who’s late. This model CVJB-G107 will completely transform your day to day life to a more exciting and completely stress free environment, Save time and money by implementing this new facial recognition time attendance system in your business. 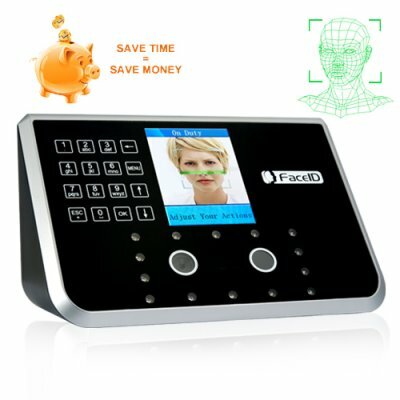 This facial recognition time attendance system is proudly presented to you by the leader in factory direct wholesale consumer electronics provider, Chinavasion. Why does it have two cameras?